Why buy multiple home security cameras to cover the large rooms in your home when a single affordable camera can see it all? The YI Cloud Home Camera is one of several popular home cams from Yi, and this model packs all of the best features into a single device. It supports full HD resolution so it has crystal clear video streams, and it also sports motion and audio detection. But the cherry on top is the fact that it can pan, tilt and zoom so that a single camera can see every inch of any room it’s in! 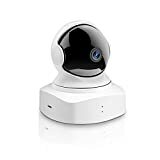 Use the coupon code YIDOMECAM to slash the price from $47 to just $35.99.